Whether you support Donald Trump or Hillary Clinton, fear might be the biggest factor driving you to the polls. Indeed, Trump has made fear central to his campaign strategy. Using divisive and isolationist rhetoric, he has invoked images of immigrants and terrorists streaming into the country unaccounted for, of inner cities rife with poverty and crime. Clinton, on the other hand, has used Trump’s words and actions to instill fears about what would happen to the country under a Trump presidency. Given the fraught tone of the campaign, it’s no surprise that a poll from over the summer found that 81 percent of voters said they were afraid of one or both of the candidates winning. For political candidates, why is it so effective to tap into voter fears? And what does the psychology research say about fear’s ability to influence behavior and decision-making? At its core, fear is an emotion that compels people to fight or take flight from a real or perceived threat. Psychological research has also shown that when we band together, the raw experience of fear – especially fear of a common enemy – can become amplified. In the early 1980s, a group of psychologists developed a way to study and understand how fear influences how we think and what we do. 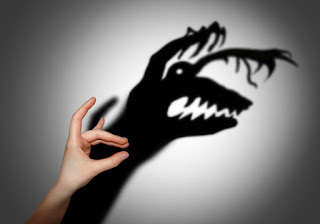 Their approach to understanding the influence of fear is now known as Terror Management Theory (TMT). Using TMT these psychologists were able to determine that, in general, fear can create and maintain some of the worst aspects of human behavior, whether it’s “offensive aggression” (aggression that’s not prompted by an actual threat), an unwillingness to compromise or racism and bigotry. On the other hand, if fears are understood, they can motivate some of the best types of human behavior, like extraordinary generosity and altruism. Psychologists have also found that when fear – instead of reason or critical thinking – influences our decisions, we make our worst mistakes. As noted earlier, people will band together in response to a common threat. It’s also important to remember that the threat needs only to be perceived; it doesn’t need to be real. For centuries, individuals campaigning for power – emperors, kings, business tycoons, politicians, military leaders – have used fear to frighten people enough so that they set aside level-headed thinking and act on their behalf. The strategy is known as fear messaging, and it’s easy to recognize. It includes repeated name-calling and denigration of a person, group of people or nation. Those with different views and other cultures and ways of life are deemed a great threat or labeled as a common enemy. The most effective fear messaging uses grossly oversimplified and generally false statements to promote verbal assaults (for example, bullying and racist and sexist phrases) and even physical violence. Fear messaging contributed to the Holocaust and the Rwandan genocide. More recently, fear messaging in response to 9/11 resulted in the wrongful implication of Iraq, public outcry for war and one of America’s worst military and international relations debacles. As part of their message, fear campaigners will also insist that they are the only ones who understand the common threat – and the only ones who can save the masses. Let’s return to the presidential campaign. Observe just one of Trump’s rallies and you will see that fear messaging – with all its violence, vulgarity, bigotry and divisiveness – is alive and thriving in America. Trump’s terrorism “plan” draws heavily from the scare tactics of the Cold War era, promises “extreme vetting” of immigrants, insists on an “ideological war” against radical Islam and promotes military acquisition of Middle Eastern oil fields. He has exploited the fear that many men have of women leaders and has subtly encouraged violence against Clinton. In an effort to fight fire with fire, Clinton has leveraged fear in her favor by encouraging voters to imagine the disastrous results of a Trump presidency. At a rally in Florida last week, she wondered aloud if the nuclear codes would be safe in his hands and hinted that black and Hispanic people might be in physical danger. “I’m the last thing standing between you and the apocalypse,” she told The New York Times back in October. This is not to say that we should ignore what frightens us. But it’s also important to understand why something is frightening us and whether or not the threat is real. Years ago, cognitive psychologist Dr. Dianna Cunningham told me that thinking creates emotion, and emotion creates behavior. She said it was our responsibility to know what we’re thinking; this way, we won’t do things we’ll later regret. Cunningham’s main point is that fear is a reaction. But it’s also a choice, a choice that intelligent human beings have the privilege and responsibility to exercise. Like reason and civility, fear is a choice. When casting your ballot, ask yourself: What will the consequences be? What role is fear playing in your decision? And is what scares you real? Ron Chandler does not work for, consult, own shares in or receive funding from any company or organization that would benefit from this article, and has disclosed no relevant affiliations beyond the academic appointment above.